But some observers are cautiously optimistic about it, noting trade between the two sides has stagnated since the last summit in 2012, while ASEAN-China trade looks set to grow with the Belt and Road Initiative. Nonetheless, Professor Tan Tai Yong of the Institute of South Asian Studies said current relations are "warm and positive". "There is broad-based economic engagement, ongoing diplomatic and defence cooperation, as well as constant cultural engagements that emphasise the civilisational ties between India and South-east Asia." Prime Minister Lee Hsien Loong yesterday called on ASEAN and India to take ties up a notch by enhancing trade, investments and connectivity. Calling India "a very important economic partner", he however noted that it accounts for just 2.6 per cent of ASEAN trade. Mr Lee was speaking at a summit in New Delhi to mark 25 years of relations between the two sides. Singapore is the ASEAN chair this year. He also urged both sides to ensure an existing free trade agreement between them stays relevant. The two sides should also work on sealing the Regional Comprehensive Economic Partnership (RCEP), he said, referring to the proposed trade pact between ASEAN and six countries, including India. "RCEP could potentially transform the entire East Asian region into a single market, comprising 45 per cent of the world's population and about a third of its current GDP," noted Mr Lee. An RCEP deal would boost India's strategic position in the region, he said, calling for negotiations to be concluded this year "so that the benefits can be realised earlier". On connectivity, Mr Lee said enhanced land, air, sea and digital links will benefit the people of ASEAN and India. ASEAN appreciates India's role in the building of the India-Myanmar-Thailand Highway, he added. But many visitors cannot reach India via land, "so we have to work towards greater air connectivity". It would help for the two sides to work on an ASEAN-India Air Transport Agreement (AIATA), he said, noting that India accounts for just 3 per cent of tourist arrivals in ASEAN countries. "The AIATA will enhance people-to-people flows across the region and help both Indian and ASEAN carriers to tap on new and emerging markets, especially in the areas of business, investment and tourism." He also called for more collaboration on digital links, such as a harmonisation of e-payment systems. Mr Lee's call comes at a time when ASEAN-India trade has stagnated. At the last commemorative summit in 2012, annual trade stood at US$75 billion, and the two sides expressed hope that it would hit US$200 billion (S$261 billion) by 2020. But trade has fallen to $70 billion - even as ASEAN-China trade grew to nearly $500 billion. South Korea trades more with ASEAN than India does, despite having a smaller economy than India. Some ways to enhance trade include better maritime and air links, more mutual recognition deals, and the easing of business visas, said Dr Faizal Yahya of the Lee Kuan Yew School of Public Policy (LKYSPP). Agreeing that there is an urgency to act, LKYSPP's Professor Ramkishen Rajan said RCEP talks have stalled in part due to India's insistence on negotiating the liberalisation of both the goods and services markets in tandem. Another reason for the lacklustre trade figures could be the after-effects of the 2008 recession, said Professor Biswajit Dhar of Jawaharlal Nehru University. Added Dr K.J. Joseph of India's Centre for Development Studies: "Trade in goods, wherein ASEAN has comparative advantage, got liberalised, whereas trade in services, wherein India has comparative advantage, is yet to be opened up." If ASEAN can agree to open up its service sector more, this imbalance can be redressed, which would enhance trade, he said. For centuries, migrants and traders travelled between the Indian subcontinent and South-east Asia, enriching both their regions. As leaders of all 10 ASEAN nations gathered here for a landmark meeting with India yesterday, Prime Minister Narendra Modi harked back to history and called for deeper maritime links and closer cooperation in security as well as technology between India and ASEAN. This friendship has been nurtured by a cultural connection, he noted. "Our shared voyage goes back thousands of years. The Ramayana, the ancient Indian epic, continues to be a valuable shared legacy in ASEAN and the Indian subcontinent," he said. "Buddhism also binds us closely. Islam in many parts of South-east Asia has a distinctive Indian connection going back several centuries," he added at the ASEAN-India Commemorative Summit to mark 25 years of ties between both sides. Mr Modi, who hosted the summit, has also invited the leaders of all 10 ASEAN countries as chief guests for India's Republic Day parade today. Yesterday, he underlined their common interest in a peaceful region. "India shares ASEAN's vision for peace and prosperity through a rules-based order for the oceans and seas. And respect for international law, notably Unclos, is critical for this," he said, referring to the United Nations Convention on the Law of the Sea. He added that maritime cooperation and security is a key issue for both regions, and was the focus of discussions at a leaders' retreat earlier in the day at the Rash-trapati Bhavan, the President's palatial residence. "We had an opportunity to discuss ASEAN-India cooperation in maritime domain as one of the key focus areas of growth and development of the Indo-Pacific region," he said. "Humanitarian and disaster relief, security cooperation and freedom of navigation will be key focus areas for our maritime cooperation." Outlining proposals to deepen ties with ASEAN, Mr Modi said India would undertake a pilot project on rural connectivity to create "digital villages" in Cambodia, Laos, Myanmar and Vietnam, saying this could be replicated in other countries. "Information and communication technology will forge new bonds of digital connectivity among us," he said. He also announced 1,000 fellowships for students and researchers to the renowned Indian Institutes of Technology, and proposed that 2019 be declared the "ASEAN-India Year of Tourism". Mr Modi has sought to boost India's ties with South-east Asia since he took office in 2014, and renamed the country's Look East policy as an Act East policy. Over the past two days, Mr Modi also met the various ASEAN leaders individually. Ms Preeti Saran, Secretary (East) in India's Ministry of External Affairs, told a press briefing that "ASEAN is at the fulcrum of India's Act East policy". On Wednesday, External Affairs Minister Sushma Swaraj launched an India-ASEAN friendship park in the capital, noting that it symbolises the friendship between India and ASEAN, and demonstrates both sides' commitment to protecting the environment. A special ASEAN-India Commemorative Summit is being held in New Delhi to mark 25 years of ties. The summit is co-chaired by the Prime Minister of Singapore, as ASEAN chair, and the Prime Minister of India. On this page are two articles from both leaders summing up ASEAN-India ties. While we commemorate 25 years of ASEAN-India relations, India's ties with South-east Asia date back more than 2,000 years. Ancient trade between India and countries such as Cambodia, Malaysia and Thailand is well documented. South-east Asian cultures, traditions and languages have been profoundly influenced by these early linkages. We see Indic Hindu-Buddhist influences in historical sites such as the Angkor Temple Complex near Siem Reap in Cambodia, the Borobudur and Prambanan temples near Yogyakarta in Indonesia, and the ancient candis in Kedah in Malaysia. The Ramayana is embedded in many South-east Asian cultures, including in Indonesia, Myanmar and Thailand. Singapore's Malay name is Singapura, derived from Sanskrit and meaning "lion city". Singapore has always advocated India's inclusion in the Asean community. India became an Asean Sectoral Dialogue Partner in 1992, a full Asean Dialogue Partner in 1995, and participated in the East Asia Summit (EAS) from 2005. The EAS is a key component of an open, inclusive and robust regional architecture, and the region's main strategic leaders-led forum. Asean-India relations were further elevated to a strategic partnership in 2012, the 20th anniversary of Asean-India relations. Today, Asean and India enjoy multi-faceted cooperation across Asean's political-security, economic and socio-cultural pillars. Prime Minister Narendra Modi's Act East policy and 3-C (commerce, connectivity, culture) formula for strengthening engagement with Asean speak to our broad-based cooperation. We have around 30 platforms for cooperation, including an annual Leaders' Summit and seven ministerial dialogues. India has participated actively in Asean-led platforms including the Asean Regional Forum, the Asean Defence Ministers' Meeting-Plus and the EAS. With the Asean-India Free Trade Area (AIFTA), Asean-India trade has risen steadily from US$2.9 billion in 1993 to US$58.4 billion (S$76.3 billion) in 2016. On the socio-cultural front, programmes like the Asean-India Students Exchange Programmes and the annual Delhi Dialogue foster closer people-to-people relations. Through these platforms, our youth, academics and businessmen get to meet, learn and deepen ties. To mark this silver jubilee of Asean-India relations, both sides have held many commemorative activities. The recent Pravasi Bharatiya Divas in Singapore recognised the contributions of the Indian diaspora. The Asean-India Commemorative Summit marks the culmination of these celebrations. It is an honour for all the Asean leaders to be in New Delhi for this occasion. Asean leaders are also deeply honoured to be invited as chief guests at today's 69th Republic Day parade. Major global trends are reshaping the strategic outlook, presenting both challenges and opportunities. The strategic balance is shifting. Demographic, cultural and political changes are under way in many parts of the world. The consensus on globalisation and free trade is fraying, but the Asian story continues to be a positive one. We need to push on with economic integration. We must also be resolute in dealing with emerging transboundary challenges, including terrorism, cybercrime and climate change. This geopolitical uncertainty gives new impetus to Asean's cooperation with key partners like India. Asean and India share common interests in peace and security in the region, and an open, balanced and inclusive regional architecture. India is located strategically along major sea lanes from the Indian Ocean to the Pacific. These sea lanes are also vital trade routes for many Asean member states. Both sides share an interest in preserving these vital maritime conduits of trade. Asean and India's combined population of 1.8 billion represents one-quarter of the world's population. Our combined gross domestic product (GDP) exceeds US$4.5 trillion. By 2025, India's consumer market is expected to become the fifth largest in the world, while in South-east Asia, middle-class households will double to 163 million. Both regions are also experiencing a demographic dividend - 60 per cent of Asean's population is below 35 years old, while India is projected to be the world's youngest country with an average age of 29 by 2020. Asean and India also have fast-growing Internet user bases, which will help us to grow the digital economy. Against this backdrop, we still have much scope to grow our ties - India accounted for only 2.6 per cent of Asean's external trade in 2016. May I suggest three promising areas of mutually beneficial collaboration. First, Asean and India should redouble efforts to promote trade and investment. We need to keep existing pathways up to date and relevant, including the AIFTA. We should work together to conclude a high-quality Regional Comprehensive Economic Partnership, surpassing the existing AIFTA. This would create an integrated Asian market comprising nearly half the world's population and a third of the world's GDP. Streamlining rules and regulations will stimulate investments in both directions, complement India's Act East policy and facilitate "Make in India" exports to the region. Second, our peoples will benefit greatly from greater land, air and maritime connectivity. We appreciate India's efforts to improve land connectivity, including the extension of the trilateral India-Myanmar-Thailand Highway, and India's US$1 billion line of credit to promote infrastructure connectivity with Asean. We look forward to working closely with India to boost our physical connectivity, including by expeditiously concluding the Asean-India Air Transport Agreement. This will enhance people-to-people flows across the region and help both Indian and Asean carriers to tap new and emerging markets, especially for business, investment and tourism. Digital connectivity is another important area of cooperation, and can shape people-to-people connections for the future. India's Aadhaar system creates many new opportunities, for instance, to harmonise our fintech platforms or connect e-payment systems. Finally, we continue to look for new synergies. One objective of Singapore's chairmanship is to develop an Asean Smart Cities Network, and here Singapore and India are natural partners. India is rapidly urbanising and has set itself a goal of establishing 100 Smart Cities. Singapore, an urbanised city-state, is ready to partner India on this journey and help develop urban solutions based on our own experience. Andhra Pradesh's new capital city of Amaravati is one example. 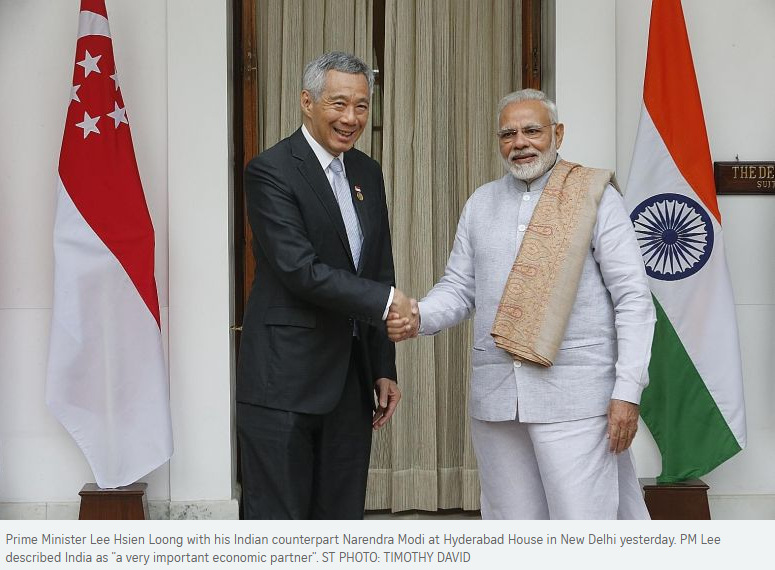 As Asean chair, Singapore is committed to deepening Asean-India ties. If both sides use our historical and cultural links to tackle today's challenges and build bridges for the future, our youth and next generation stand to gain the most. This article was first published in the Times of India yesterday. Today, 1.25 billion Indians will have the honour to host 10 esteemed guests - leaders of Asean nations - at India's Republic Day celebrations in our capital, New Delhi. Yesterday, I had the privilege to host the Asean leaders for the Commemorative Summit to mark 25 years of Asean-India partnership. Their presence with us is an unprecedented gesture of goodwill from Asean nations. Responding to this, on a winter morning, India has come out to greet them in a warm embrace of friendship. This is no ordinary event. It is a historic milestone in a remarkable journey that has brought India and Asean to a deepening partnership of great promise for their 1.9 billion people, about one-fourth of humankind. India-Asean partnership may be just 25 years old, but India's ties with South-east Asia stretch back more than two millennia. Forged in peace and friendship, religion and culture, art and commerce, language and literature, these enduring links are now present in every facet of the magnificent diversity of India and South-east Asia, providing a unique envelope of comfort and familiarity between our people. More than two decades ago, India opened itself to the world with tectonic changes. And, with instincts honed over centuries of interaction, it turned naturally to the East. Thus began a new journey of India's reintegration with the East. For India, most of our major partners and markets - from Asean to East Asia to North America - lie to the East. And South-east Asia and Asean, our neighbours by land and sea, have been the springboard of our Look East and, since the last three years, the Act East policy. Along the way, from dialogue partners, Asean and India have become strategic partners. We advance our broad-based partnership through 30 mechanisms. With each Asean member, we have growing diplomatic, economic and security partnership. We work together to keep our seas safe and secure. Our trade and investment flows have multiplied several times. Asean is India's fourth-largest trading partner; India is Asean's seventh. Over 20 per cent of India's outbound investments go to Asean. Led by Singapore, Asean is India's leading source of investments. India's free trade agreements in the region are its oldest and among the most ambitious anywhere. Air links have expanded rapidly and we are extending highways deep into continental South-east Asia with new urgency and priority. Growing connectivity has reinforced proximity. The over six-million-strong Indian diaspora in the region - rooted in diversity and steeped in dynamism - constitutes an extraordinary human bond between us. Our economic partnership covers every area of priority for our two nations. Singapore is India's leading destination and source of investments. Singapore's inspirational multiculturalism and respect for talent have nurtured a vibrant and dynamic Indian community that is contributing to deeper cooperation between our nations. And India and Asean are doing much more. Our partnership in Asean-led institutions like the East Asia Summit, ADMM+ (Asean Defence Ministers' Meeting-Plus) and ARF (Asean Regional Forum) is advancing peace and stability in our region. India is also an eager participant in the Regional Comprehensive Economic Partnership agreement, seeking a comprehensive, balanced and fair agreement for all 16 participants. The strength and resilience of partnerships come not just from the arithmetic of numbers, but also from the underpinnings of the relationship. India and Asean nations have relations free from contests and claims. We have a common vision for the future, built on commitment to inclusion and integration, belief in sovereign equality of all nations irrespective of size, and support for free and open pathways of commerce and engagement. Asean-India partnership will continue to grow. With the gift of demography, dynamism and demand - and with rapidly maturing economies - India and Asean will build a strong economic partnership. Connectivity will increase and trade will expand. In an era of cooperative and competitive federalism in India, our states are also building productive cooperation with South-east Asian nations. India's north-east is on a resurgent path. Links with South-east Asia will accelerate its progress. In turn, a connected north-east will be a bridge to the Asean-India ties of our dreams. 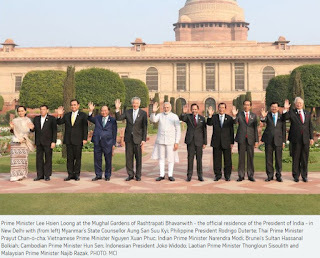 As Prime Minister, I have attended four annual Asean-India Summits and East Asia Summit. These have reinforced my conviction in Asean unity, centrality and leadership in shaping the region in this vision. This is a year of milestones. India turned 70 last year. Asean reached the golden milestone of 50 years. We can each look to our future with optimism - and to our partnership with confidence. At 70, India exudes the spirit, enterprise and energy of its young population. As the fastest-growing major economy in the world, India has become the new frontier of global opportunities and an anchor of stability of the global economy. With every passing day, it is easier and smoother to do business in India. I hope that Asean nations, as our neighbours and friends, will be an integral part of New India's transformation. We admire Asean's own progress. Born when South-east Asia was a theatre of a brutal war and a region of uncertain nations, Asean has united 10 countries behind a common purpose and a shared future. We have the potential to pursue higher ambitions and address the challenges of our times, from infrastructure and urbanisation to resilient agriculture and a healthy planet. We can also use the power of digital technology, innovation and connectivity to transform lives at unprecedented speed and scale. A future of hope needs a solid bedrock of peace. This is an age of change, disruptions and shifts that comes only rarely in history. Asean and India have immense opportunities - indeed, enormous responsibility - to chart a steady course through the uncertainty and turbulence of our times to a stable and peaceful future for our region and the world. Indians have always looked East to see the nurturing sunrise and the light of opportunities. Now, as before, the East, or the Indo-Pacific region, will be indispensable to India's future and our common destiny. Asean-India partnership will play a defining role in both. And, in Delhi, Asean and India renewed their pledge for the journey ahead. The leaders of Asean and India have expressed their intention to conclude the Regional Comprehensive Economic Partnership (RCEP) by this year - and they will have to work to make it happen, Prime Minister Lee Hsien Loong said yesterday. He added that all of the Asean leaders had made the point on early conclusion "forcefully", while Indian Prime Minister Narendra Modi had said India would "exert efforts" to make it happen. But whether it can conclude this year will depend on countries at the negotiating table closing the gaps in perspectives and expectations among them, Mr Lee told the Singapore media as he wrapped up a six-day visit of Sri Lanka and India. "I cannot say for sure that it will happen, but I heard the leaders speaking yesterday, and all of them expressed the right sentiments," he said. The RCEP is a free trade deal that brings together Asean, India, China, Japan, Australia, South Korea and New Zealand. It will cover almost half the world's population if successful. Mr Lee, who co-chaired Wednesday's Asean-India commemorative summit - as Singapore chairs Asean this year - pushed hard for a commitment to seal the regional trade pact by this year. One argument he made to his counterparts was that the deal should be seen as more than just an economic one. "When you make a trade agreement like this, it is very seldom only about economics or trade. There is always another aspect to it - of bilateral cooperation, of friendship, of strategic calculation," he said. As Asean chair, Singapore will facilitate the deal "as an honest-broker coordinator", he added. "We will bring Asean together and try and work out an arrangement and agreements which will command consensus," he said. But Mr Lee added that the countries will have their work cut out, as it means "you have to work through domestic interest, you have to work through your trade bureaucracies and your ministries and your other agencies". 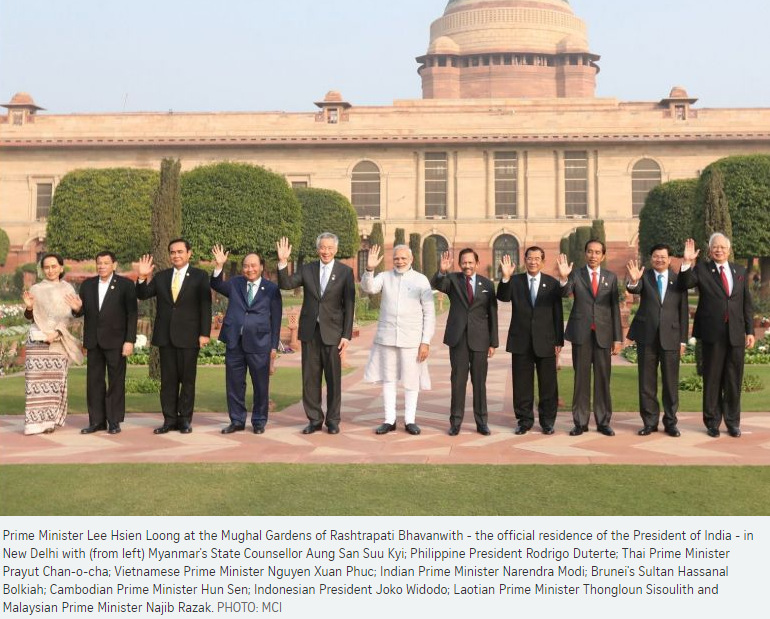 He and other Asean leaders attended India's Republic Day Parade yesterday as chief guests of the country. This is the first time India has invited more than one foreign leader to be chief guest, a gesture Asean is deeply honoured by, Mr Lee said. During the trip, he also pushed for an Asean-India Air Transport Agreement, which will expand air links between cities in Asean and India. Responding to this at a bilateral meeting with Mr Lee, Mr Modi had invited Singapore Airlines to fly to smaller cities in India's north-west, like Guwahati in the state of Assam. Asked if Singapore will take up the offer, Mr Lee said: "The (Singapore) carriers have to evaluate it... The business may or may not be there yet, so the business case has to be assessed carefully." With air traffic between India and Asean growing, he said, the "practical thing to do is to follow... the trend where the traffic is, and then build up as you go along, and at the same time, explore some new destinations". While Asean-India flights have increased, demand for flights has grown faster, he added. "So, purely from a connectivity and business point of view, there is a strong case for having more flights." Mr Lee was also asked to assess the trip to India - whether he saw substantive progress made. He said: "Progress in Asean is never overnight and in quantum leaps. It is always gradual and incremental. Over time, we hope that individual modest steps add up to something significant. "This trip would be in that nature - another step forward, valuable and positive. And we hope we will build on it over time." NEW DELHI • Ten individuals from Asean, including Singapore's Ambassador-at-large Tommy Koh, have been chosen to receive India's Padma Shri award. The Padma awards are among the highest civilian honours given by India, and the awardees are named annually on the eve of Republic Day, which marks the day the country adopted its current Constitution. A total of 85 Padma awards were announced on Thursday. Padma Shri, the fourth highest civilian honour, is given for "distinguished service" in various fields. The move to pick awardees from all 10 Asean members is aimed at promoting India's ties with the bloc, reported the Press Trust of India. "In an unprecedented and symbolic gesture of India-Asean bonding and on the occasion of the silver jubilee of India-Asean partnership and our Republic Day, PM Modi announced the Padma Shri award for one individual from each Asean country," Ministry of External Affairs spokesman Raveesh Kumar tweeted on Thursday. Professor Koh, Cambodia's youngest parliamentarian Hun Many and Myanmar historian Thant Myint-U were cited for their contributions in the field of public affairs. Malai Haji Abdullah Malai Haji Othman, the founder of the Society for Management of Autism Related Issues in Training, Education and Resources of Brunei, was cited for his work in the field of medicine. Indonesian sculptor Nyoman Nuarta, Malaysian classical dancer Ramli Ibrahim and the deputy director of Laos' Vat Phou World Heritage Site, Mr Bounlap Keokangna, were cited for their contributions to the arts. Philippine businessman Jose Ma Joey Concepcion III was cited for his work in trade and industry. The other awardees were Thailand's Supreme Patriarch Somdet Phra Ariya Wongsa Khottayan, and the secretary-general of the National Vietnam Buddhist Sangha, Mr Nguyen Tien Thien. Prof Koh, 80, has served as Singapore's ambassador to the United States and the United Nations, and as president of the Third United Nations Conference on the Law of the Sea (Unclos) in 1981 and 1982. He is currently chairman of the board of governors of the Centre for International Law at National University of Singapore. Prof Koh told The Straits Times that he is "very honoured and grateful" to receive the award. "I have always loved India and the Indian civilisation, and Indian food, music, dance and literature. For the past 10 years, I had the pleasure and privilege of co-chairing the India-Singapore strategic dialogue. I hope I have made a small contribution to strengthening the bridge of friendship between our two countries and peoples," he said.